وجه العملة تمثال سيدة الحرية ترتدي قبعة مجنّحة (عادة لعبادة اللإله عطارد) كما أنها تصورها شبه ميتة و المخ ظاهر، قبعتها ممزقة اللحم يغطي جسدها وعبارة "مورك ديم 2018 50 Zombucks "
تمثال سيدة الحرية ترتدي قبعة مجنّحة (عادة لعبادة اللإله عطارد) كما أنها تصورها شبه ميتة و المخ ظاهر، قبعتها ممزقة اللحم يغطي جسدها وعبارة "مورك ديم 2018 50 Zombucks "
1 أوقية قطعة نحاسية لمورك ديم من Zombucks The Murk Diem is the fifth round in the ten round Zombucks series. This round is based on the US circulation, so-called "Mercury Dime" that was minted from 1916 - 1945. The Mercury Dime was designed by Adolph Weinman and featured Lady Liberty with a winged Phrygian cap that caused her to be often mistaken for the god Mercury. It is believed that Weinman used Elsie Stevens, wife of the lawyer and poet Wallace Stevens, as the model for Lady Liberty. The obverse featured Lady Liberty surrounded by the words "Liberty In God We Trust" and the year. But beware! Lady Liberty has had her day. On the obverse her once emblematic Phrygian cap is now decaying and dishevelled hair along with oozing brains can be seen protruding from the once pristine cap. Torn ligaments and rotting flesh replace the once delicate lines of her beautiful face. Even her teeth are visible as places once covered by flesh are now laid bare. The word "Liberty" has even been replaced by "Murk Diem", a corruption of the old saying, "Carpe Diem" ie "Seize the day" or perhaps "Mercurii Die" "Day of Mercury". The year of mintage and value in cents have been replaced by 50 Zombucks and 2018, the year the zombies walk the earth. One thing is certain, no one is safe from the Zombie Apocalypse. 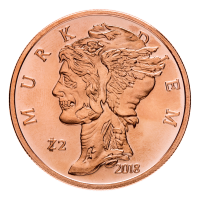 Made from 999 pure copper, the 2018 Zombucks Murk Diem copper round follows the Walker, Morgue Anne, Zombuff, and Barber designs and precedes the five designs yet to come in both silver and copper. Each design commemorates historical coins and figures in numismatic history. Make sure you get your Zombucks Murk Diem Copper Rounds now and add them to your collection of other Zombucks and Apocalypse copper rounds.